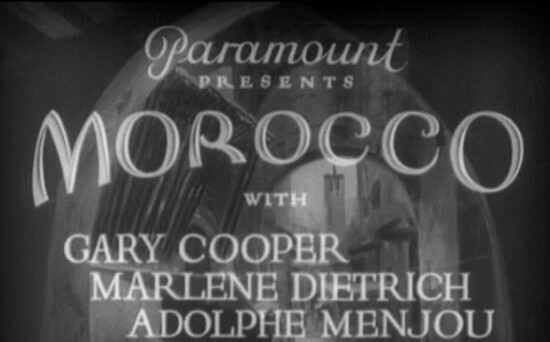 Last night I indulged in watching Josef von Sternberg's 1930 classic Morocco before heading out for my Saturday evening. It's a perfect hot summer movie as Von Sternberg's cinematography really captures the heat of Morocco, and I'm a sucker for any of those black and white movies that are set either in the jungle (like Red Dust) or the desert. 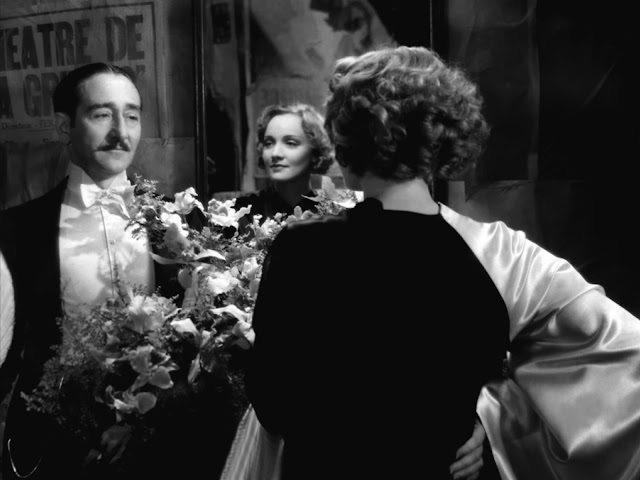 Von Sternberg's cinematography also happens to be one of the main influences on a genre that I love--film noir. Morocco stars his frequent collaborator and muse (and rumored lover), Marlene Dietrich. 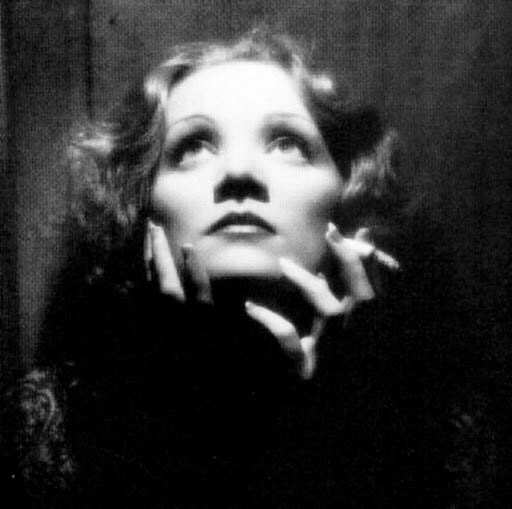 Von Sternberg is known for giving Marlene her image and making her a star. The way he lit her for film was absolutely incredible, as you can see in the images below. He also cut out any superfluous dialogue for her to avoid that heavy German accent stumbling as she learned her way in film. He taught her to move languidly through scenes and gaze at seemingly unimportant objects (like a lamp) for six seconds so that he could make her body and face the focus of every scene. And that body and face were outfitted in some magnificent costumes from Paramount designing legend Travis Banton through their pictures together, such as Shanghai Express, Blonde Venus, The Scarlet Empress, and The Devil is a Woman. 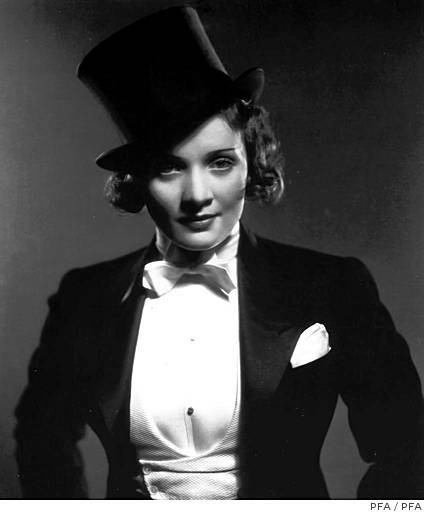 In Morocco, though, the costumes included one that became iconic--Marlene in a tuxedo. It was a shock to the public and made an enormous buzz when it came out. Keep in mind that these were the days in America when women did not really wear pants much less a man's tuxedo. 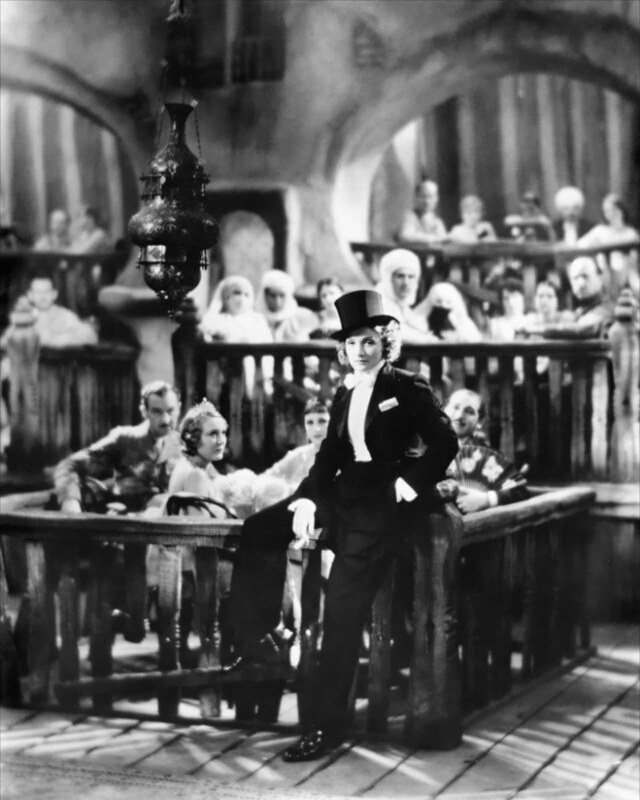 And not only did she don a tuxedo to do her singing, but she seduced two men while dressed like one--including the beautiful Gary Cooper--and also dared to kiss a woman in the audience during her number. This was in the pre-Code days of Hollywood and allowed her to get away with being so bold. After around 1932, the censors would have never allowed that kiss on film. Marlene became known in Hollywood for wearing trousers quite often--both in real life and on film--and was absolutely stunning doing it. Literally stunning, I should add. I've heard a story of her at Bullock's Wilshire in white pants and matching overcoat and stunning the entire place into silence because she was so gorgeous walking into the department store. Many stars today have been inspired by this look...Sharon Stone quickly comes to mind. Modern designers, too, will often incorporate tuxedo pants into their collections for women now. Yves Saint Laurent was one of the first and famous for this look. Marlene also wore dresses extremely well. Von Sternberg was known to be a bit of a tyrant (as well as Marlene's Svengali) and made her lose weight before putting her on film. I should point out that this was the 1930s when dresses were cut on the bias, too, which meant that dresses hugged every curve of Marlene's strong body. 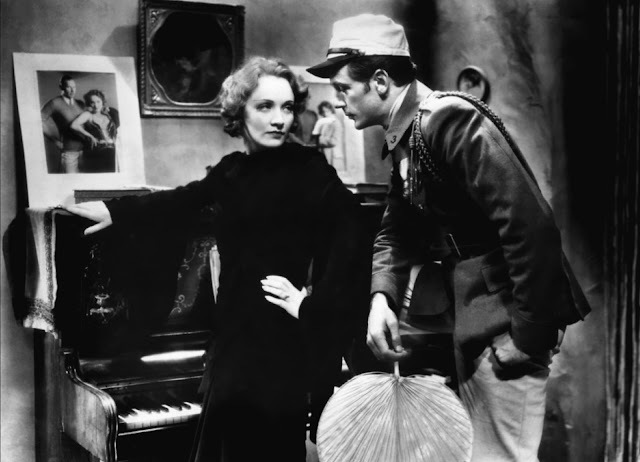 And the characters she played were usually some sort of fallen woman--in Morocco, she plays a cabaret singer who's hiding out from some sort of past--so Von Sternberg could really stretch the limits of what Marlene would wear on film. Banton designed loads of dramatic clothing that included luxurious materials like feathers and would often showcase Marlene's famous legs. 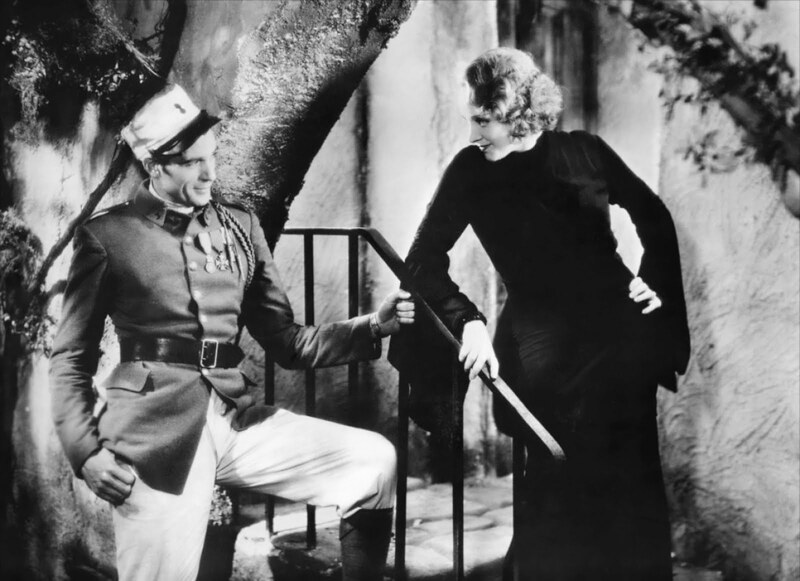 In the end of the film, Marlene's character must chose between the comfort of Adolphe Menjou's money and the love she feels for Gary Cooper's poor French legionnaire. The potential redemption of love is an ongoing theme in Von Sternberg movies, so you can guess who she chooses. The film ends after the scene below, with her following the French forces into the desert...just a white silk blouse, tulip skirt, scarf, and heels that she promptly kicks off to march in the hot sand after the hot Gary Cooper. So thrilled that you enjoyed this introduction to her and this movie as well. Supposedly Cooper and Von Sternberg did not get along AT ALL on this picture--Cooper thought that he should be the star here, not Marlene. So it's doubly interesting to watch his acting style alongside Marlene's...both were quite distinct. Can't wait to hear how you like the movie!